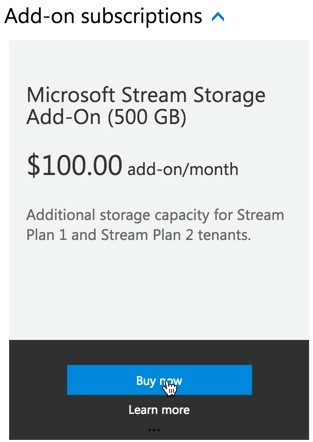 When your organization purchased Microsoft Stream, you received 500 GB of base storage and an additional 0.5 GB of storage per licensed user. If you need additional storage for your Stream content, you can purchase one or more 500 GB storage add-ons. To purchase Microsoft Stream add-on for an organization, you must be an Office 365 Global Tenant Admin or Billing Admin. Sign in to Office 365 with your work or school account as a global admin. For more information, see sign in to Office 365 for business. Select the Office 365 App launcher and then click Admin. 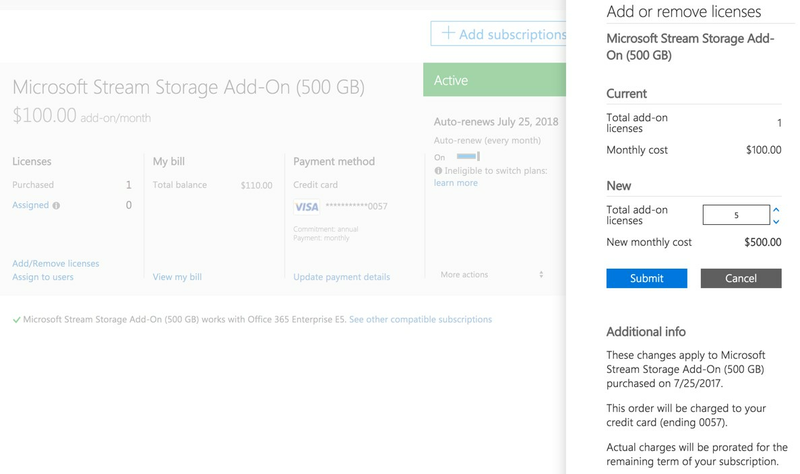 In the Office 365 admin center, choose Billing > Subscriptions. On the Subscriptions page, select the subscription that you want to buy an add-on for. On the bottom-left corner of the subscription details, choose Add-ons > Buy add-ons. Under Add-on Subscriptions, mouse over or tap the add-on subscription that you want to buy, and then choose Buy now. Enter the number of add-on licenses that you need. Choose whether you want to pay each month or for the whole year. Review the pricing information, and then choose Next. Provide your payment information, and then choose Place order > Continue. On the Subscriptions page, select the add-on subscription that you want to update, and then choose Add/Remove licenses. Enter the number of user licenses that you need in the box, and then click Submit. You can use the up-arrow and down-arrow to change the quantity of add-on licenses or just enter the number you want in the box.